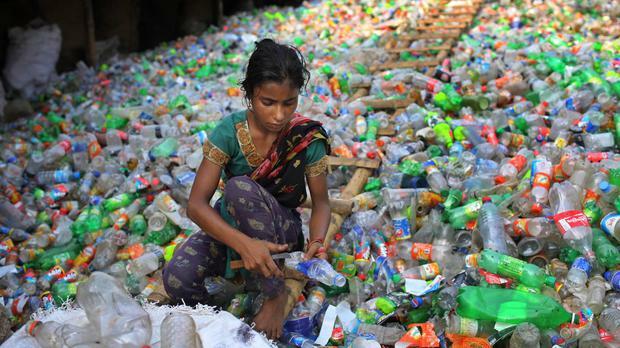 Bangladeshi girl Sefaly, 13 years old, removes labels and caps from plastic bottles as she works at a recycling factory in Dhaka, Bangladesh. Thousands of Bangladeshi children who live in the capital's slums are working illegally for an average of 64 hours a week, with many employed by the garment industry making clothing for top global brands, according to a new report. The report by the London-based Overseas Development Institute found that 15 percent of children aged six to 14 were not attending school so they could work full time. At the age of 10, about eight percent of slum-dwelling children had jobs, the report said. By the time they reached 14, almost half were already working. The report was based on a survey of 2,700 slum households in Dhaka. In Bangladesh, it is illegal for children under 14 to work. It is also illegal to ask anyone to do "hazardous work" for more than 42 hours a week. But child labour persists, as some factories do not require ID cards from their workers or do not understand that employing children is against the law. Authorities did not immediately respond for requests for comment. Children would like to go to school, the report's co-author Maria Quattri said in a statement, "but poverty was driving parents to find jobs for their children, even though they could see that it would jeopardise their long-term future". Bangladesh's garment industry, the world's second largest after China, provides an economic lifeline for the impoverished country, accounting for some 25 billion US dollars (£20 billion) in annual exports. It also employs around four million workers, most of them women. Industry insiders say factories struggle to keep employees from moving to jobs elsewhere.